In what football lovers around the world still affectionately recall as Nigeria’s heyday, Emmanuel Amuneke was there to deliver some of the most pivotal moments for the Super Eagles. The one-time Barcelona player is now working to be a chief provider for a new class he hopes will one day surpass the feats of his iconic 90s team, and while the sound has softened for the man who used to tear down the wing, the fundamentals live on in all he does. On a July day in Foxborough, the green shirts of Nigeria were shining that bit brighter in the early Massachusetts afternoon as the FIFA World Cup debutants moved into a first-half lead against Italy. It was 25 minutes into their last-16 clash of a 1994 tournament they had already starred in, and while extra-time’s final whistle brought dejection after Roberto Baggio’s double turned the game, they had laid down a magnificent new marker in Nigerian and African sporting history. Nigeria would get to the last 16 twice more in World Cups to come, although no Super Eagles squad has yet bettered what that groundbreaking Class of ‘94 managed. It is easy to see how 1990s nostalgia proudly shines on in today’s popular culture and global football lovers who remember that World Cup edition in the United States reserve plenty for the likes of Daniel Amokachi, Sunday Oliseh, Rashidi Yekini and company. There was also Emmanuel Amuneke, the winger who struck in the emphatic opening group win over Bulgaria and the one who reacted to flick home that Italy game’s first goal. Named the 1994 African Footballer of the Year, the rapid wideman danced in time to the history-making Nigerian rhythm that decade, and he recalls how he broke new ground in the 90s with a bumping soundtrack in tow. “Well as a young guy I used to love rap music. I loved rap, a lot of r&b, in the era of Dr. Dre, Snoop Doggy Dogg, Boyz II Men. In addition to his World Cup exploits, Emmanuel had actually set up the goal to get them there for the first time in national team history, crossing for Finidi George to net against Algeria in the qualifiers. With a club career that had until then been spent back home and in Egypt, his goals in USA ’94 had projected him to an audience far beyond what he’d previously known. A tireless worker on the pitch and wholeheartedly respectful off it, he was the consummate teammate in a playing career that took in spells with prestigious European club names Sporting Clube de Portugal and FC Barcelona, although he would take the personal limelight with an especially golden moment. It was his last-gasp goal against Argentina that won Nigeria the Olympic tournament in 1996, making them the first African nation to do so. His coaching path has since taken him to leading his country’s Under-17s, and while football has long been a source of exceptional inspiration as well as enjoyment for youngsters in Nigeria, the music world can also stake a claim. In recent years, the afrobeats genre has gained significant international popularity and Emmanuel thinks there is empowerment within the creative corner of his homeland. “I think music and sport have always gone hand in hand. They are both motivating the young ones and music for me is part of life. “Music says a lot of things and you can use music to bring a whole lot of countries together. You can interpret it in different ways and it can change people’s mindset. “Recently, there’s a lot of music that I like. I mostly like listening to pop music and I like Coldplay. “A lot of Nigerian artists, of course: we have Wizkid, we have Phyno, we have Olamide. A lot of them, young ones coming up. Every corner of the footballing world brings its own culture and we have become accustomed to seeing many African players letting the dance rhythm flow after scoring or after a win. Emmanuel was an exciting and talented risk-taker during his playing days, but he also described himself as ‘all business’ when it came to a game. That philosophy is very much seen in his coaching, and while he believes there is a time and place to show off the moves, that sort of natural expression has most definitely been a part of his own life in football. “I think every team has their own style of celebrating and individual players have their own style. Right now as a coach, what we are trying to do is to see how we can bring the players to be focused, to achieve their objectives. “There’s nothing wrong in dancing, but I think that the most important thing is to focus on what you want to achieve and at the end of the day, if you achieve your objectives, you can dance to whatever kind of music, whatever you want to do. Of course music is part of the game in Africa, not only dancing, but when we are going to the game we are singing and clapping on the bus, we are giving thanks to God and trying to use it to motivate ourselves and build confidence to the players. A number of Emmanuel’s playing career achievements happened in stadiums that have staged other significant events in sport and music. One example was Sanford Stadium in Athens, Georgia, the scene of his aforementioned winning goal against Argentina in the Atlanta Olympics and also where country music star Jason Aldean headlined the venue’s very first concert in front of 60,000+ in 2013. Emmanuel brought crowds to their feet in huge stadiums but says he’s never been to a live music show in one, so who would be top of his list to see perform? “Well of course if I’m privileged to watch Coldplay live. Most of this music makes sense and when you see good music that makes a lot of sense, then I think you try to identify with it. With his fellow Super Eagles, Emmanuel shared so many magnificent memories in different places – like their own international tour. Asked which player (a former teammate or any player from all-time) he would choose to get together with for some shooting practice, he opted for getting the old group back together to do what they did best. “My teammates in the national team that I was very privileged to have shared great memories with; I have a lot of them. I have (Sunday) Oliseh, I have Finidi (George), Mutiu Adepoju, (Daniel) Amokachi, Ike Shorunmu, the goalkeeper. An international debutant as a 22-year-old in Nigeria’s April 1993 Africa Cup of Nations qualifier with Ethiopia, Emmanuel hadn’t been called upon in the subsequent tournament in Tunisia in March/April 1994 until Clemens Westerhof threw him into the starting lineup for the final with Zambia. He would bring his country level at 1-1 on five minutes before striking a 47th-minute winner that etched Nigeria’s name onto the trophy for the second time. 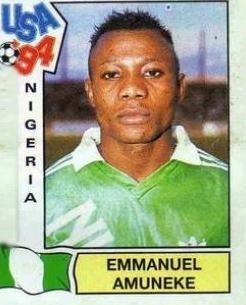 You could say Emmanuel had the knack for delivering a big moment for the national team; whether scoring himself, or assisting as he did when he crossed for Finidi George against Algeria in 1993 to send Nigeria to their very first World Cup. After months of anticipation, the Super Eagles lined up in Dallas for the opening match of the 1994 tournament, facing a Bulgarian team in its own golden spell. Led by the mercurial Barcelona forward Hristo Stoichkov, who was named FIFA World Player of the Year runner-up in 1992 and 1994 and would be a future Barça teammate of Emmanuel, Bulgaria would reach the semis but were beaten 3-0 by Nigeria. Rashidi Yekini and Daniel Amokachi fired them into a 2-0 first-half lead at the Cotton Bowl, before Emmanuel flung himself at Finidi George’s cross to score a memorable diving header. It was a sensational way to let the watching world know that the newcomers were on a mission, as Emmanuel recalls. “Well first of all, we were determined. It’s a very great privilege to be in the World Cup; we had been watching all the other teams play in it on TV and 1993/1994 was the year of Nigeria. “We were able to break the jinx and make it to the World Cup and I was part of that team. I think our confidence was high and individually and collectively, we believed in our ability. “We knew that we had good players and talented individuals, so our talk was always about how we can play together as a team. For the first game, when you look at the calibre of players for Bulgaria, the likes of Stoichkov, (Krasimir) Balakov, (Ivaylo) Yordanov, players that are playing in top clubs in Europe, the game would have been given to them. The second game took Clemens Westerhof’s team from Texas to the East Coast, and just eight minutes in at Foxboro Stadium, Nantes striker Samson Siasia lifted a finish over the advancing Luis Islas. Although Claudio Caniggia’s double turned the game in Argentina’s favour by the 28th minute and gave them a lead they would retain, Nigeria had gone toe-to-toe with their renowned opponents. Captained by Diego Maradona and with players like Gabriel Batistuta, Roberto Sensini and Diego Simeone, were there any words at the end for Emmanuel and his teammates? “They didn’t say much. It was a very, very intensive game. “Maradona is somebody I think our generation all cherished, we all watched him play; Mexico in the World Cup where he was able to dribble past a lot of people from the midfield to score. Then 1994 we were privileged to be standing next to Maradona and having that opportunity to play against him. In the final group encounter, goals from George and Amokachi ensured that Nigeria would not only progress but also win the group, setting up a last-16 clash with Italy, three-time winners of the competition. For the third game in succession, Nigeria were playing in Foxborough, Massachusetts and they looked set for the most incredible of feats when they still led 1-0 in the closing minutes after Emmanuel had reacted sharpest to hook home a 25th-minute finish following a corner. Like Daniel Amokachi, Emmanuel had to depart with an injury and he wasn’t on the field when Gianfranco Zola received a red card on 75 minutes, while he could only watch on as Roberto Baggio cut a low finish into the corner and a dagger to the Super Eagles with two minutes remaining. Baggio’s penalty 12 minutes into extra-time cannoned in off the post and there was ultimately no way back for the West Africans. It was a night Emmanuel remembers as a sleepless one, although what is beyond doubt is how much of a foundation had been laid for football and footballers in Nigeria. Public support grew and grew during the tournament as observers saw how much ability, spirit and unique style the Super Eagles possessed. Outside of games and preparation, Emmanuel remembers a World Cup where the players were able to enjoy the moment, but with a shared professional mindset as their beating heart. “I think we had normal freedom. The most important thing is being disciplined and realising why you are at the World Cup. “I think there were normal rules, as long as we know when to train. We have a lot of Nigerians living in America who came to training to see the team and we had a lot of support from the Americans as well. “Like I said, we were able to convince people; people don’t support you when you are not convincing. They started liking our team and supporting us. “Unfortunately for us, the journey stopped against Italy. I believe we also lost that game because of lack of experience, but along the years we learn from our experience. The vast majority of Nigeria’s squad in the U.S. were already signed to clubs around Europe, so Emmanuel was something of an anomaly in that sense as he represented Zamalek of Egypt. He had won two league titles while with ZSC and moved to Lisbon giants Sporting CP off the back of a sparkling World Cup. It was legendary Moroccan defender Noureddine Naybet he spent most of his free time with in Portugal, while he also pays tribute to head coach at the time, Carlos Queiroz, for the faith he invested in him. In June 1995, he would celebrate domestic cup glory, playing the entire 2-0 Taça de Portugal final win over Marítimo alongside the likes of Luis Figo and aforementioned Bulgarian World Cup stars Krasimir Balakov and Ivaylo Yordanov. At the beginning of that year, Nigeria had been in Saudi Arabia to compete in the King Fahd Cup (now the FIFA Confederations Cup). Having scored their first of the tournament in a 3-0 win over Japan, Emmanuel later stepped up to take a decisive penalty in the third-place playoff shootout with Mexico, but was denied by the memorably flamboyant Jorge Campos. He would, however, bounce back wonderfully at the 1996 Olympics. The Games were held in Atlanta but the football tournament took place at various locations around America, with the two most memorable matches for Nigeria coming in front of huge crowds at the University of Georgia’s Sanford Stadium. Dutch coach Jo Bonfrére was at the Super Eagles helm for the first of his two stints in charge and he saw a young Nwankwo Kanu shine with a dramatic 90th-minute leveller for 3-3 in the semi-final with Brazil, before the silky forward struck the golden goal. Emmanuel’s crowning moment was waiting in the final, with 86,117 there to see it. Facing Argentina, Nigeria had twice been behind in the match but they would deliver the knockout punch right at the end. Having come on for Viktor Ikpeba, Emmanuel was fouled down the left flank by Javier Zanetti, and as the Argentinian offside trap failed spectacularly, he swept home Wilson Oruma’s cross on the volley. The Nigerian flags were waving joyously as the Super Eagles’ bench ran onto the field and Emmanuel feels a great sense of happiness at what it did not just for his country, but for his continent. “I think it was a turning point for African football. It was the first time an African team should win the gold medal in Olympic football. “It’s a moment of people realising that Africa has good players. After that, the next Olympics, Cameroon went and won it, so it showed there is potential in Africa. 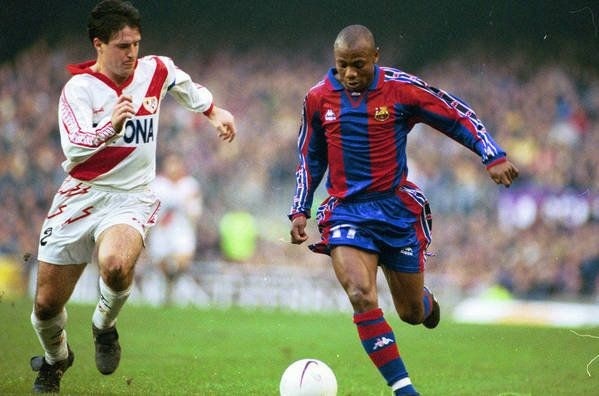 While playing in Egypt, Emmanuel had said to himself that he would play for Barcelona, and before 1996 was up, he had indeed arrived in Catalonia. The coach who signed him was the late Sir Bobby Robson, one of football’s fondly remembered characters and somebody Emmanuel still speaks of with deep respect. “He was a man with a lot of experience, a lot of knowledge, and a man who can give you confidence. He brought me to Barcelona and he gave me the confidence, he gave me the limelight; may his soul rest in peace. 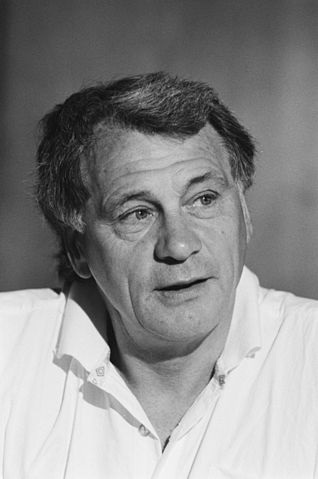 “When we were young, we watched him coach England in the Italian World Cup, when they played against Cameroon. Having the privilege to play under someone you have watched on TV and now he is your coach and he is the one who believes in you. “When I was in Portugal, he was at Porto. It will always be an honour to have worked with him. Emmanuel would remain at Camp Nou until 2000, but would sadly find himself severely limited by knee injuries that didn’t allow his explosive creativity the stage it deserved. His teammates included Luis Figo, Ronaldo, Pep Guardiola, and later Rivaldo and Patrick Kluivert, and they were not only stars on the field according to Emmanuel. “The players I met when I came to Barcelona, they were marvellous. They were human, they made it very easy to adapt, they took me as part of them. “I came in December time but I was able to feel I had been there from the beginning of the season. I had a great time there with the players: Guardiola, Abelardo, (Gheorghe) Popescu, Luis Figo was my teammate in Sporting Lisbon and he was ahead of me in Barcelona. There would be later spells with Albacete of Spain’s Segunda División, Busan I’Cons of South Korea and Al-Wehdat in Jordan, and although he had injury misfortune beyond his control, Emmanuel had led a career that lives long in the memory. His name also stood proudly atop the list of African players in 1994, as he was honoured with the African Footballer of the Year award by the Confederation of African Football. “That year was great. I also won the BBC African Footballer of the Year, so it was a very great moment for me. “It was a happy moment because you’re talking about (Rashidi) Yekini, George Weah; top players who are playing at European clubs. I was playing in Egypt, at Zamalek, and I was able to make a statement that it’s not about where you play; regardless of where you play, you can be what you want through hard work, dedication and discipline. To play in the biggest stadiums and competitions is a dream held by many footballers, and of course so many want to get their hands on trophies and medals during however many years their career can last. As an individual and with his teammates, Emmanuel captured so much that is pure about our beautiful game in how he graced showpiece tournaments with skill, unpredictability and invention, putting his name down in history with a smile. His former teammate, one-time midfield maestro Jay-Jay Okocha, said how he would play the game on the streets growing up in Nigeria, using any ball or object he could find, which is a picture that also resonates with Emmanuel as he looks back on the early makings of him as a player. “We all started from the street and from the primary school. Sometimes we use the orange when there is no ball. “Nobody taught us how to control the ball; it was just basically natural talent, but there was of course still high determination. When you watch TV, you always say ‘I want to play in this league, I want to play in this club,’ but one thing is to say you want to play, another is to go through what it takes. 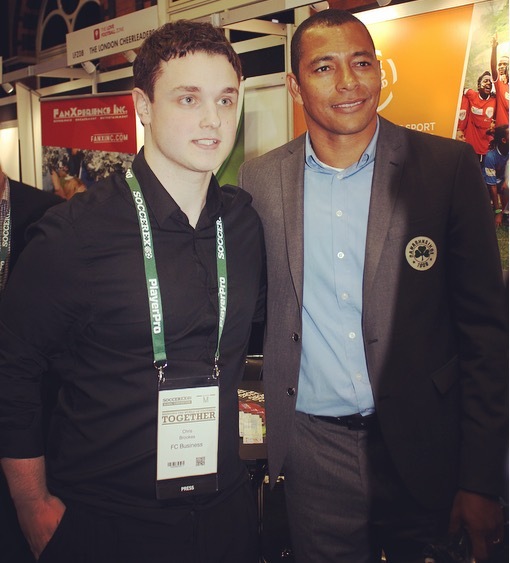 “In modern football, there seems to be a lot of young players who don’t realise there’s a long journey. When you are working very hard and things are not going your way it looks as if it is the end of the road, but I believe everybody in life has their time and their moment. Speaking for this interview during a break with family in Spain, Emmanuel talked about his role over the last three years with Nigeria’s Under-17s, who won the World Cup under Manu Garba in 2013 before triumphing under Emmanuel in Chile in 2015. He had been assistant to Garba for that success in the United Arab Emirates four years ago and has also worked with him more recently for the Under-20 side. The 2015 success Emmanuel presided over was the Golden Eaglets’ record-breaking fifth in the tournament and the team contained potential standouts of the future, such as midfielder Kelechi Nwakali and forward Victor Osimhen, who have since joined Arsenal and VfL Wolfsburg respectively. Making the point that hard work is non-negotiable and there is no shortcut to success, Emmanuel says that the senior World Cup in Qatar in 2022 could be one in which Nigeria shine, if the program is properly invested in. A continued level of coaching consistency within the national setup will surely be key, and it would be very hard to find a personality who believes more strongly in the future of his country’s game. A man who prefers meeting others who share the same ideals of respect as he does, rather than being flashy or ostentatious, there has been some uncertainty over the spelling of Emmanuel’s surname over the years. He confirms it is ‘Amuneke’ and not ‘Amunike’ as some sources state, but it is down in the record books in any case. For our final conversation point, it was back to those special days out on the field, and to the ones who went through it all with him. Asked to imagine playing one more time, in a team of five alongside any of his career’s teammates, Emmanuel had plenty of aforementioned greats and varying nationalities to choose from. As he considered his response, he decided his starting team places could only truly go to a selection of those who were co-pilots on his Super Eagles flight. “I would like to have Ike Shorunmu, Finidi (George), Sunday Oliseh, and I would like to have Mutiu Adepoju. The players that I have mentioned, they are quiet, they are just like any other human being.